The festive dinner on Christmas Eve is the most glamorous and the one prepared with love and care. 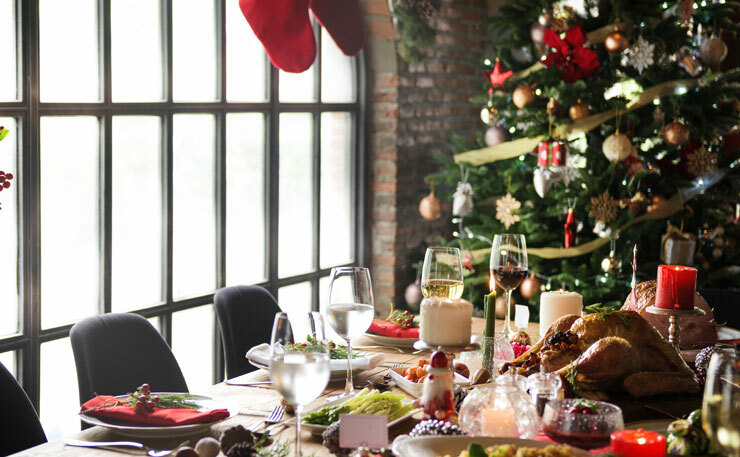 Whether it is just for the family, or for friends, or it is an open and social event, the Christmas Eve dinner is one where memories are created. Your guests will depend on you for that unique Holy Night of the year and it’s up to you to make them feel both comfortable but also emotional. Put on your warmest smile and give them an enthusiastic welcome that implies you are in the mood for some serious fun. The Christmas menu is the king of the night! -Salads: Well begun is half done! Start by making impressive salads. A very good idea is a green salad with cream cheese and walnut sauce. As festive as necessary with the addition of dried walnuts and the distinctive flavour of Fig Balsamic Cream. You can even invest in the luxury of prosciutto and pecan nuts. Alternatively, you can make a festive salad with prosciutto and goat cheese which of course is perfectly complemented with the Lemon and Orange Balsamic Cream. Citrus fruits will bring out the rich taste of the prosciutto and your guests will be impressed. -Starters: To work up an appetite! -Main course: Memories are created here! The festive Christmas Eve dinner is a joy and its preparation is a sheer delight. There are no limitations and you are free to combine various main dishes. Anyway, we rarely serve just one main dish in such large by nature dinner parties. -Dessert: there is always room for dessert! As we round up our menu, we must consider the dessert. After a rich meal it is advisable to offer a light dessert so as not to burden our guests. Blondies with White Chocolate and Forest Fruit Jam are an excellent proposition for an epilogue to your menu, while to the unrepentant chocolate lovers you can offer a chocolate tart with orange and balsamic cream. -The drinks: All in good measure, even if it’s Christmas! Drinks are usually decided according to the main course. If, however, you have significant fluctuations and flavours between appetizers and the main course, you can offer different wines to your guests, but without large deviations between them. For example, you can accompany salads and cheese and charcuterie board with a rosé wine, and then continue with a white wine for your turkey or pork. With dessert you can offer a sparkling wine or some alcoholic fruit sorbet. We prefer the sorbets because they clear the palate and we are able to better feel the taste of the next dish. -Decorating the Christmas table: or else, the gift wrap! It is worth putting some extra effort for the decoration of the Christmas table. You will not regret the extra time you will need and your guests’ smiles will surely reward you. Start by dressing your table with the most beautiful tablecloth. It’s not a problem if you do not have a Christmas tablecloth. Use a white one that is neutral and allows you to “play” more easily with the rest of the decoration elements. Set the table correctly with the best of your dinnerware: Dish for the main course, smaller plate for the appetizers and salad on top. Place the cutlery on the right, above the dishes the teaspoon that hints the expectation of the dessert and on its right the glasses for water and wine. In the middle of the table you can place fresh, not fake, mistletoe. With its characteristic red balls it is the hallmark of the Christmas decoration. Alternatively, place a large Christmas wreath on the table with some imposing candle. Finally, a nice idea is to place the stemmed glasses of water and wine upside down with a red tea-light on each foot. Make music lists to entertain your guests. On their arrival and until you sit at the table, go for some Christmas jazz. During the meal, switch to some light or classical music at a lower level of volume. After dinner, excite your guests with music that will inspire them to dance till the wee hours. Finally don’t forget to plan for a commemorative gift to thank them for passing this Holy Night with you. A charm for the forthcoming New Year or a Polaroid photo you took that night with a dedication on the back is just right.